Kiahuna Deluxe 2 BR Condo...Contact Owner for Rates! Located on the sunny south side of Kauai at Poipu Beach, this romantic setting is one of Hawaii's best. Beautiful golden beaches, gorgeous sunsets, swaying palms, and spectacular Kiahuna Plantation grounds make our condo an unbeatable location for your 'dream vacation'. 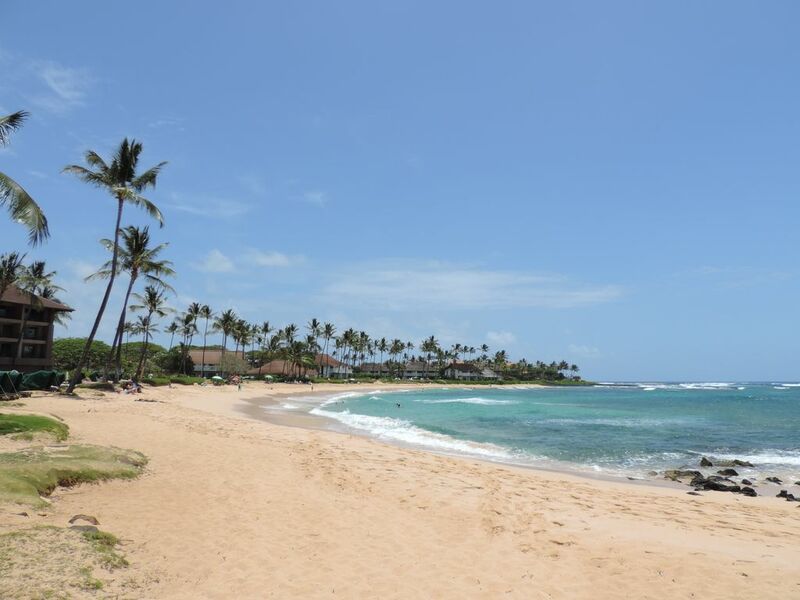 Poipu is an ideal beach for swimming, snorkeling and surfing....rated the best on Kauai. The condo is conveniently located to both fine and casual restaurants, unique shopping spots, and excellent golf courses. This location is perfect for taking advantage of all the wonderful activities Kauai has to offer. Our spacious 2 bedroom, 2 bath condo comfortably sleeps up to six. The upper floor with kitchen, living room and lanai has beautiful views of the ocean, lagoon, and plantation gardens. We have recently remodeled the kitchen adding granite counter and new cabinets. The bedrooms are located on the first floor with an additional lanai off the master bedroom. You will be furnished with everything you need for a perfect visit including a washer/dryer, bedding, towels, and a fully equipped kitchen. Gas BBQ's are located close to the unit. With such a lovely location it is fun to fix some meals 'at home'! A beach hut is available for beach towels and chairs as well as snorkel and surf equipment rentals. For families with young children, our condo has two porta cribs, a stroller and booster seats for the little ones. There is even a big supply of beach toys, a must for a fun day in the sand! The entire Kiahuna Plantation offers a peaceful, quiet location to relax and enjoy your Hawaiian vacation. Our unit is managed by Castle Resorts, 2253 Poipu Road, Koloa, Kauai. The reception desk is open 24 hours per day for your check in and any other needs. We hope you will chose this wonderful Spot in Paradise for your 'home away from home' in Kauai. Kiahuna Plantation is truly a Hawaiian Paradise with beautiful grounds and located on Poipu Beach, the best in the island. As an old plantation, the resort is not high rise buildings, but beautiful single and double story buildings with individual condos surrounded by lush tropical gardens and beautiful ocean views. Our condo has no units above or below which makes it private and quiet. The condo is just steps from the beach. Our family has enjoyed staying here from the time our kids were babies. Now they are enjoying this condo with their own families. Although there is no need to leave Kiahuna, it is centrally located to shopping, sight seeing, and golf. Our favorite activities are snorkling right in front of the resort and taking long walks along the beach to watch the whales, sea turtles, and monk seals. It is truly a wonderful vacation spot. Beach towels provided at the Beach Hut. New Athletic club with Fitness Room, pool and spa available to renters. Newly remodeled kitchen with granite counters, new cabinets, and enhanced lighting. Tennis courts available at the Athletic Club. Great golfing at the Kiahuna Golf Course right next to the resort. Access to the new Poipu Athletic Club provided when renting our condo. Cathedral ceiling in great room, beach chairs and towels provided. Porta-cribs, booster seats and stroller available.